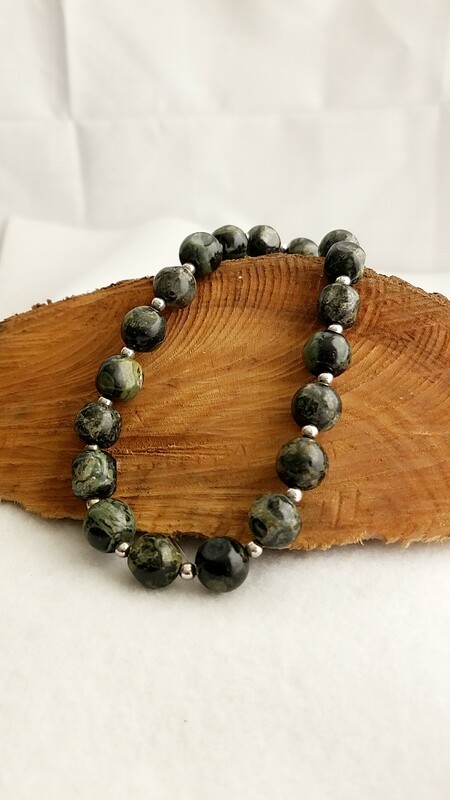 The Peaceful Valor Kambaba Jasper Necklace is rich with color. 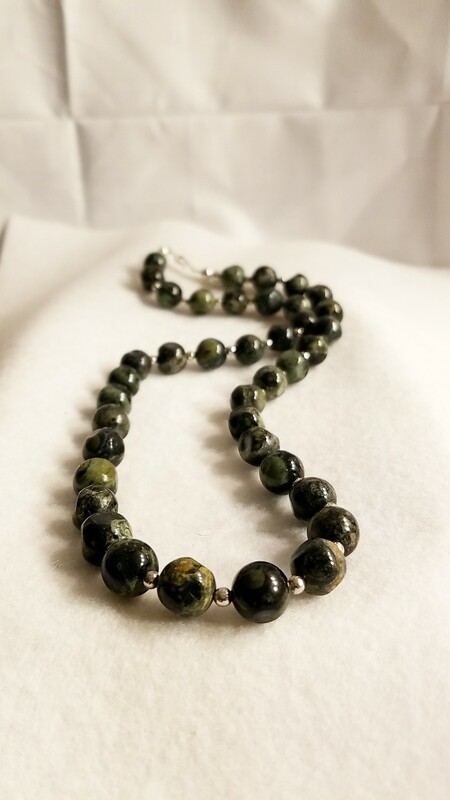 The Peaceful Valor Kambaba Jasper Necklace really lives up to its name. With its rich deep dark tones of green and rich earthy cream colors as well. It works well with earthy colored outfits and will give any free spirit outfit a boost of color that it needs. 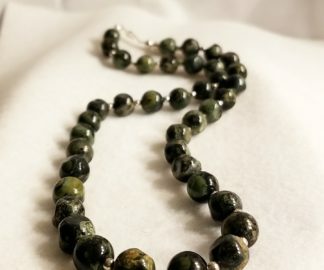 The Peaceful Valor Kambaba Jasper Necklace really lives up to its name. With its rich deep dark tones of green and rich earthy cream colors as well. It works well with earthy colored outfits and will give any free spirit outfit a boost of color that it needs. Do you need to balance out your outfit before heading out for the day? Let this alluring necklace do the trick. Kambaba Jasper is one of the more exotic Jaspers, a rare orbicular variety from Madagascar and South Africa. In its depths, one can literally glimpse the origins of life on our planet and touch a tangible form of the primordial ooze that nurtured our atmosphere and advanced the creation of all living things. A sedimentary stone, Kambaba Jasper is comprised of microcrystalline Quartz interlaced with Stromatolites. Ancient fossilized colonies created by cyanobacteria (blue-green algae) and other primeval microorganisms. These Stromatolites date back more than three billion years and are the oldest known fossils, containing the earliest records of life on Earth. Kambaba Jasper is a stone of Peace and Tranquility, imbued with the nourishing green energy of Nature. It dark mystic circles and deep green swirls comforts and protects, calms and relaxes, soothing troubled minds and restoring balance to the body and spirit. Its slow steady frequency expands one’s ability to focus and is a remarkable aid in meditation, granting the release of negative thoughts and feelings, especially those that plague one’s consciousness on a continual basis. 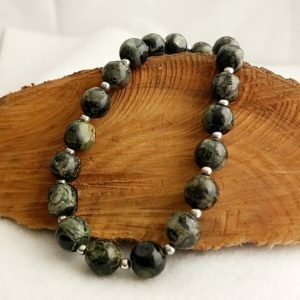 Therefore if you would like more information about the gemstones and items I use in making my handmade items like this, The Peaceful Valor Kambaba Jasper Necklace Materials Description Page. Let this The Peaceful Valor Kambaba Jasper Necklace pull you in with its rich color!